One week after taking the lead in the race for the 2018 MATCH Series overall championship, Sycamore Racing V's Jessica Krupnick held off challenges by three horses in three different divisions to make it official. 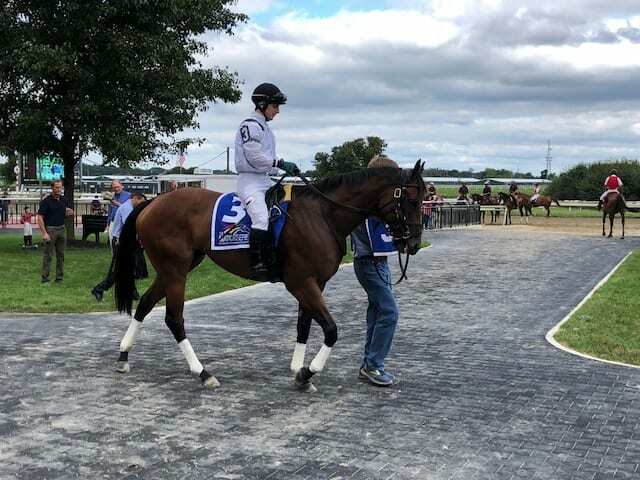 Trained by Tres Abbott at Fair Hill Training Center, Jessica Krupnick on Sept. 15 finished second in the Roamin Rachel Stakes, the last of five races in the Filly and Mare Sprint—Dirt Division, at Parx Racing and led the series with 34 points. Three MATCH Series races, two with horses eligible to win the title or tie at the top, were scheduled for the same day at Laurel Park but were moved to Sept. 22 because of potential impact from Hurricane Florence. A victory by Hillside Equestrian Meadows' Laki in the grade III Frank J. De Francis Memorial Dash, the final series race of the year, would have given him the overall MATCH title by one point, but he finished second to Switzerland in the race and wrapped up a full five-race series campaign with 32 points. The long round-trip to Erie, Pa., paid off in two ways for Sycamore Racing. It sealed the top spot in the Filly and Mare Sprint—Dirt Division for Jessica Krupnick, who competed in four of five series races, and also helped spur interest from a Canadian group looking for broodmares. Sycamore Racing is operated by Tres Abbott's father, Francis, in southeastern Pennsylvania. For the overall championship, the partnership will receive $50,000 as owner and the trainer will get $25,000. For winning the division, the payouts are $20,000 for the owner and $15,000 for the trainer for a grand total of $110,000 in bonus money put up by participating horsemen's groups in the Mid-Atlantic region. Laki, a 5-year-old Maryland-bred gelding by Cuba, took the overall series lead in August with a victory—after the disqualification of Lewisfield—in the Polynesian Stakes at Laurel. Lewisfield was in the running for the 3-Year-Olds and Up Sprint—Dirt Division title but finished fifth in the De Francis Dash, so Laki, who raced in all five division races, was the winner. Though Laki didn't win the De Francis, Dilovodico's son, Nicholas, who is active in the family's Laurel-based racing operation, ended up in the winner's circle with Switzerland, who was stabled at the Dilodovico barn that week in the absence of trainer Steve Asmussen. The humor wasn't lost on his father. De Francis winner Switzerland, owned by Woodford Racing, won the grade III Maryland Sprint at Pimlico Race Course to kick off the MATCH Series in May but didn't compete in the series again until the last leg. He was the only horse to win two races in the division but didn't qualify for bonus money, which requires a minimum of three starts. Pimlico-based Mary Eppler won the 3-Year-Olds and Up Sprint—Turf Division as trainer and owner with Oak Bluffs, and the 3-Year-Olds and Up Long—Dirt Division with Page McKenney as trainer. Eppler, whose two horses started in eight MATCH Series races, will collect $50,000 for her efforts. The MATCH Series this year offered 25 races valued at a total of $2.9 million at seven tracks: Laurel and Pimlico in Maryland; Parx, Hollywood Casino at Penn National Race Course and Presque Isle in Pennsylvania; Delaware Park; and Monmouth Park in New Jersey. Participating horsemen's groups—Thoroughbred Horsemen's Association affiliates in Delaware, Maryland, New Jersey and Pennsylvania; and the Pennsylvania Horsemen's Benevolent and Protective Association—anted up bonus money, of which almost $400,000 will be paid. This year's MATCH Series, the first since 2001, for the first time offered state-bred breeder bonuses courtesy of the Maryland Horse Breeders Association, Thoroughbred Breeders Association of New Jersey, Pennsylvania Horse Breeders Association and the Delaware Certified Thoroughbred Program. The following breeders will each receive $5,000 because their horses earned the most points overall in the male or female category. This entry was posted in NL List, Racing and tagged Henny Hughes, Horse Racing, jessica krupnick, laki, MATCH, match series, parx, Sycamore Racing, tres abbott, Uncle Mo by MATCH Series Release. Bookmark the permalink.